The Concordia Greenhouse City Farm School is an integrative, focused urban agriculture program. The project responds to a growing interest in issues around food sovereignty and the practice of urban agriculture. City Farm School facilitates education through an experience-based model and provides an opportunity for students and community to collaborate. 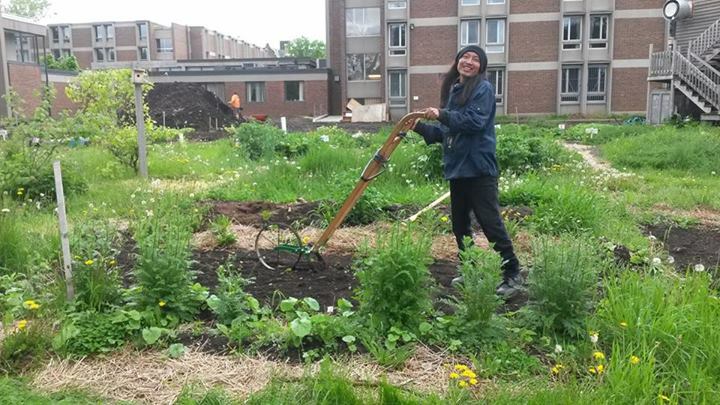 Students participate in internships in a garden project here in Montreal. Monthly workshops, and weekly hands-on training with a horticulturalist, will give students the knowledge to start their own garden projects in following years. Students also engage with the local community, hosting tours of the gardens, giving workshops, learning from partner organizations and practicing social economy by selling some of our bounty. Skills and experiences that students can have in their toolbox by seasons end include: Greenhouse seedling management, Garden design and implementation, medicinal herbs, composting, fertilization, pest management, water catchment, workshop hosting, a trip to a local organic farm, as well as hosting our harvest party! Visit the City Farm School website for more details.